UNDERGROUND FOR BASEMENTS, SWIMMING POOLS, WATERTANKS, TUNNELS ETC. By using acrylic based / Polyurethane waterproof coatings with glass fiber reinforcements. Over the cleaned roof above mentioned coating shall be applied in various layers. With glass fiber as reinforcements in intermediate layers with special treatment to all the penetrations providing as homogeneous water proof layer. For accessible roofs mechanical protection layer will be applied. 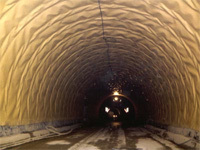 By using modified bitumen reinforced membranes from Sika , STP or Texsa in various thickness and layers. On cleaned and smooth surface of roof primer will be applied. Over the primed surface bitumen membrane of various thickness can be applied and welded by gas flame. Special treating all the penetrations. And providing aluminum flashings and sealant on the upstand. By using PVC / TPOs / PPs. fiber reinforced membranes from Carlisles USA. Insuwrap or SIKA- Sarnafil. Membranes shall be laid over smooth cleaned roof with a separation layer. Membranes together shall be welded with hot special welding machines. Specially treating all the penetrations and providing aluminum flashing and sealant on top of upstand. 2. BATHROOMS & KITCHEN WATERPROOFING By using Cement based Polymer modified waterproofing flexible Slurry Coating. Using chemical Coatings from branded manufacturers. Concrete surface will be prepared as per manufacturer’s procedure. Cracks in concrete if any will be repaired by suitable materials. 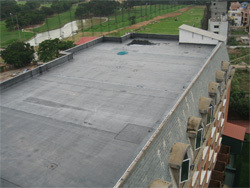 On prepared surface two coats of above coating shall be applied in sufficient thickness to provide waterproofing layer. 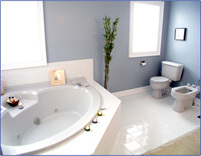 Bathroom tiles can be directly applied over the waterproofing layer . By using acrylic based / Polyurethane waterproof coatings with glass fiber reinforcements. Over the cleaned concrete above mentioned coatings from Sika or equivalent shall be applied in various layers. With glass fiber as reinforcements in intermediate layers with special treatment to all the penetrations providing as homogeneous water proof layer. Bathroom tiles shall be laid over the water proofing layer. 4. INTERNAL LINING OF WATER TANKS By using non toxic for portable water flexible PVC/ Polyethylene fiber reinforced membranes from Insuwrap or SIKA- Sarnafil. Non toxic membranes shall be laid inside the tanks surface with polyester fiber cushion. Membranes will be welded by hot air special welding machines treating all the flanges etc. membranes shall be mechanically fixed on top of walls and sealed by non toxic sealant. By using Non Toxic Epoxy Coatings. 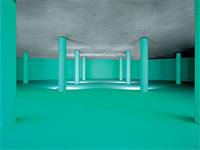 5.UNDERGROUND FOR BASEMENTS, SWIMMING POOLS, WATERTANKS, TUNNELS ETC. By using modified bitumen reinforced membranes from Sika, Texsa or STP in various thickness and layers. By using EPDM, PVC. Or Poly Olefines, fiber reinforced flexible membranes from Carlisle Insuwrap or SIKA- Sarnafil.